September 2016 issue on sale now! | What Hi-Fi? September 2016 issue on sale now! Some top TVs ranging from 32in to 65in, and HD-Ready to flagship 4K HDR OLEDs feature in this month’s issue. We’ve also pitted three £500 home cinema amplifiers against one another and rounded up some of the best headphones available right now. Throw in the usual array of First Tests, features and Temptations and the September 2016 issue is not to be missed! 4K, HDR and OLED may be TV technologies grabbing the headlines right now, but there was once a time when HD-Ready was the “next big thing” - 2005 to be precise. At that time a 32in TV was also considered a big screen, whereas today they are used more as second-room sets. But they are still hugely popular, so we’ve rounded up three 32in HD-Ready screens from LG, Panasonic and Sony to see which one should takes the crown for best second-room screen. For many, £500 is the sweet spot for a home cinema amplifier. Whether you’re buying or replacing, £500 often provides the perfect balance between features, connectivity and performance. 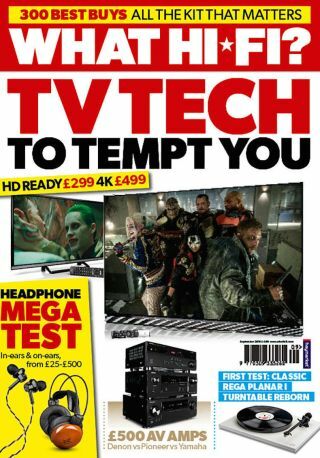 We’d be inclined to agree, as the three models from Denon, Yamaha and Pioneer we’ve reviewed this month will show. The £500 home cinema category is one of the most hotly anticipated at every Awards ceremony, which one will reign supreme? The list of different types of headphones makes for exhaustive reading: in-ear, on-ear, over-ear, noise-cancelling, wireless, open-backed, closed-backed. With so much choice, we felt it right time to provide you with a round-up of some of the many pairs available right now, from £17-£600. We’re sure you’ll find something to suit you. For this month’s Insider we had the laborious task of travelling to Sardinia to visit McIntosh Labs. While there, we learned of the company’s plans for international expansion, including developing more World of McIntosh flagship townhouses to join the one in New York, as well as some new products planned, including the Sonus Faber SF16 all-in-one hi-res wireless music system. Our Temptations section this month features Leema’s new Libra DAC, which when looked at on paper could be the ultimate high-end DAC. It has an almost endless list of features and connectivity options that make for impressive reading. But can it deliver an equally enviable performance? We’ve also been testing a pair of premium floorstanders from Audio Physic which employ an unusual placement for the bass driver. Of course, no issue of What Hi-Fi? would be complete without the First Tests section and this month we’ve got some great five-star products. LG’s stunning OLED65E6V is our lead review, thanks in no small part to the jaw-dropping picture is delivers. It’s without doubt the best TV we’ve ever seen. There’s also a review of Rega’s new Planar 1 turntable, Sony’s budget BDP-S6700 Blu-ray player and the newest member of the Bluesound family, the Flex. Don’t forget, you can download the digital edition of the magazine directly to your smartphone or tablet. Happy reading!